Faisal Memon of NGINX, Inc.
We all know that the performance of applications and web sites is a critical factor in their success. The process of making your application or web site perform better, however, is not always clear. Code quality and infrastructure are of course critical, but in many cases you can make vast improvements to the end user experience of your application by focusing on some very basic application delivery techniques. One such example is by implementing and optimizing caching in your application stack. This blog post covers techniques that can help both novice and advanced users see better performance from utilizing the content cache features included in NGINX. A content cache sits in between a client and an “origin server”, and saves copies of all the content it sees. If a client requests content that the cache has stored, it returns the content directly without contacting the origin server. This improves performance as the content cache is closer to the client, and more efficiently uses the application servers because they don’t have to do the work of generating pages from scratch each time. There are potentially multiple caches between the web browser and the application server: the client’s browser cache, intermediary caches, content delivery networks (CDNs), and the load balancer or reverse proxy sitting in front of the application servers. Caching, even at the reverse proxy/load balancer level, can greatly improve performance. As an example, last year I took on the task of performance tuning a website that was loading slowly. One of the first things I noticed was that it took over 1 second to generate the main home page. After some debugging, I discovered that because the page was marked as not cacheable, it was being dynamically generated in response to each request. The page itself was not changing very often and was not personalized, so this was not necessary. As an experiment, I marked the homepage to be cached for 5 seconds by the load balancer, and just doing that resulted in noticeable improvement. The time to first byte went down to a few milliseconds and the page loaded visibly faster. NGINX is commonly deployed as a reverse proxy or load balancer in an application stack and has a full set of caching features. The next section discusses how to configure basic caching with NGINX. Only two directives are needed to enable basic caching: proxy_cache_path and proxy_cache. The proxy_cache_path directive sets the path and configuration of the cache, and the proxy_cache directive activates it. The local disk directory for the cache is called /path/to/cache/. levels sets up a two‑level directory hierarchy under /path/to/cache/. Having a large number of files in a single directory can slow down file access, so we recommend a two‑level directory hierarchy for most deployments. If the levels parameter is not included, NGINX puts all files in the same directory. keys_zone sets up a shared memory zone for storing the cache keys and metadata such as usage timers. Having a copy of the keys in memory enables NGINX to quickly determine if a request is a HIT or a MISS without having to go to disk, greatly speeding up the check. A 1‑MB zone can store data for about 8,000 keys, so the 10‑MB zone configured in the example can store data for about 80,000 keys. max_size sets the upper limit of the size of the cache (to 10 gigabytes in this example). It is optional; not specifying a value allows the cache to grow to use all available disk space. When the cache size reaches the limit, a process called the cache manager removes the files that were least recently used to bring the cache size back under the limit. inactive specifies how long an item can remain in the cache without being accessed. In this example, a file that has not been requested for 60 minutes is automatically deleted from the cache by the cache manager process, regardless of whether or not it has expired. The default value is 10 minutes (10m). Inactive content differs from expired content. NGINX does not automatically delete content that has expired as defined by a cache control header (Cache-Control:max-age=120 for example). Expired (stale) content is deleted only when it has not been accessed for the time specified by inactive. When expired content is accessed, NGINX refreshes it from the origin server and resets the inactive timer. NGINX first writes files that are destined for the cache to a temporary storage area, and the use_temp_path=off directive instructs NGINX to write them to the same directories where they will be cached. We recommend that you set this parameter to off to avoid unnecessary copying of data between file systems. use_temp_path was introduced in NGINX version 1.7.10 and NGINX Plus R6. And finally, the proxy_cache directive activates caching of all content that matches the URL of the parent location block (in the example, /). You can also include the proxy_cache directive in a server block; it applies to all location blocks for the server that don’t have their own proxy_cache directive. With this sample configuration, if NGINX receives an error, timeout, or any of the specified 5xx errors from the origin server and it has a stale version of the requested file in its cache, it delivers the stale file instead of relaying the error to the client. proxy_cache_revalidate instructs NGINX to use conditional GET requests when refreshing content from the origin servers. If a client requests an item that is cached but expired as defined by the cache control headers, NGINX includes the If-Modified-Since field in the header of the GET request it sends to the origin server. This saves on bandwidth, because the server sends the full item only if it has been modified since the time recorded in the Last-Modified header attached to the file when NGINX originally cached it. proxy_cache_min_uses sets the number of times an item must be requested by clients before NGINX caches it. This is useful if the cache is constantly filling up, as it ensures that only the most frequently accessed items are added to the cache. By default proxy_cache_min_uses is set to 1. The updating parameter to the proxy_cache_use_stale directive, combined with enabling the proxy_cache_background_update directive, instructs NGINX to deliver stale content when clients request an item that is expired or is in the process of being updated from the origin server. All updates will be done in the background. The stale file is returned for all requests until the updated file is fully downloaded. With proxy_cache_lock enabled, if multiple clients request a file that is not current in the cache (a MISS), only the first of those requests is allowed through to the origin server. The remaining requests wait for that request to be satisfied and then pull the file from the cache. Without proxy_cache_lock enabled, all requests that result in cache misses go straight to the origin server. The two proxy_cache_path directives define two caches (my_cache_hdd1 and my_cache_hdd2) on two different hard drives. The split_clients configuration block specifies that the results from half the requests (50%) are cached in my_cache_hdd1 and the other half in my_cache_hdd2. The hash based on the $request_uri variable (the request URI) determines which cache is used for each request, the result being that requests for a given URI are always cached in the same cache. Please note this approach is not a replacement for a RAID hard drive setup. If there is a hard drive failure this could lead to unpredictable behavior on the system, including users seeing 500 response codes for requests that were directed to the failed hard drive. A proper RAID hard drive setup can handle hard drive failures. This section answers some frequently asked questions about NGINX content caching. Can the NGINX Cache Be Instrumented? MISS – The response was not found in the cache and so was fetched from an origin server. The response might then have been cached. BYPASS – The response was fetched from the origin server instead of served from the cache because the request matched a proxy_cache_bypass directive (see Can I Punch a Hole Through My Cache? below.) The response might then have been cached. EXPIRED – The entry in the cache has expired. The response contains fresh content from the origin server. STALE – The content is stale because the origin server is not responding correctly, and proxy_cache_use_stale was configured. UPDATING – The content is stale because the entry is currently being updated in response to a previous request, and proxy_cache_use_stale updating is configured. REVALIDATED – The proxy_cache_revalidate directive was enabled and NGINX verified that the current cached content was still valid (If-Modified-Since or If-None-Match). HIT – The response contains valid, fresh content direct from the cache. How Does NGINX Determine Whether or Not to Cache Something? By default, NGINX respects the Cache-Control headers from origin servers. It does not cache responses with Cache-Control set to Private, No-Cache, or No-Store or with Set-Cookie in the response header. NGINX only caches GET and HEAD client requests. You can override these defaults as described in the answers below. NGINX does not cache responses if proxy_buffering is set to off. It is on by default. Can Cache-Control Headers Be Ignored? NGINX ignores the Cache-Control header for everything under /images/. The proxy_cache_valid directive enforces an expiration for the cached data and is required if ignoring Cache-Control headers. NGINX does not cache files that have no expiration. Can NGINX Cache Content with a Set-Cookie in the Header? Yes, with the proxy_ignore_headers directive, as discussed in the previous answer. Can NGINX Cache POST Requests? This example enables caching of POST requests. Can NGINX Cache Dynamic Content? Yes, provided the Cache-Control header allows for it. Caching dynamic content for even a short period of time can reduce load on origin servers and databases, which improves time to first byte, as the page does not have to be regenerated for each request. Can I Punch a Hole Through My Cache? The directive defines request types for which NGINX requests content from the origin server immediately instead of trying to find it in the cache first. This is sometimes referred to as “punching a hole” through the cache. In this example, NGINX does it for requests with a nocache cookie or argument, for example http://www.example.com/?nocache=true. NGINX can still cache the resulting response for future requests that aren’t bypassed. What Cache Key Does NGINX Use? The default form of the keys that NGINX generates is similar to an MD5 hash of the following NGINX variables: $scheme$proxy_host$request_uri; the actual algorithm used is slightly more complicated. For this sample configuration, the cache key for http://www.example.org/my_image.jpg is calculated as md5(“http://my_upstream:80/my_image.jpg”). Note that $proxy_host variable is used in the hashed value instead of the actual host name (www.example.com). $proxy_host is defined as the name and port of the proxied server as specified in the proxy_pass directive. To change the variables (or other terms) used as the basis for the key, use the proxy_cache_key directive (see also the following question). Can I Use a Cookie as Part of My Cache Key? This example incorporates the value of the JSESSIONID cookie into the cache key. Items with the same URI but different JSESSIONID values are cached separately as unique items. Does NGINX Use the ETag Header? In NGINX 1.7.3 and NGINX Plus R5 and later, the ETag header is fully supported along with If-None-Match. If the file is up‑to‑date in the cache, then NGINX honors a byte range request and serves only the specified bytes of the item to the client. If the file is not cached, or if it’s stale, NGINX downloads the entire file from the origin server. If the request is for a single byte range, NGINX sends that range to the client as soon as it is encountered in the download stream. If the request specifies multiple byte ranges within the same file, NGINX delivers the entire file to the client when the download completes. Once the download completes, NGINX moves the entire resource into the cache so that all future byte‑range requests, whether for a single range or multiple ranges, are satisfied immediately from the cache. Please note that the upstream server must support byte range requests for NGINX to honor byte range requests to that upstream server. Does NGINX Support Cache Purging? NGINX Plus supports selective purging of cached files. This is useful if a file has been updated on the origin server but is still valid in the NGINX Plus cache (the Cache-Control:max-age is still valid and the timeout set by the inactive parameter to the proxy_cache_path directive has not expired). With the cache‑purge feature of NGINX Plus, this file can easily be deleted. For more details, see Purging Content from the Cache. How Does NGINX Handle the Pragma Header? Does NGINX Support the stale-while-revalidate and stale-if-error Extensions to the Cache-Control Header? The stale-while-revalidate extension of the Cache-Control HTTP header permits using a stale cached response if it is currently being updated. The stale-if-error extension of the Cache-Control HTTP header permits using a stale cached response in case of an error. These headers have lower priority than the proxy_cache_use_stale directive described above. Does NGINX Support the Vary Header? Yes, in NGINX Plus R5 and NGINX 1.7.7 and later. Here is a good overview of the Vary header. The ngx_http_proxy_module section of the of the NGINX documentation contains all of the configuration options for content caching. Two NGINX content caching webinars are available on demand (option 1, option 2). These webinars step through much of the information presented in this blog post. The Content Caching section of the NGINX Plus Admin Guide has more configuration examples and information on tuning the NGINX cache. The Content Caching with NGINX Plus product page contains an overview on how to configure cache purging with NGINX Plus and provides other examples of cache customization. 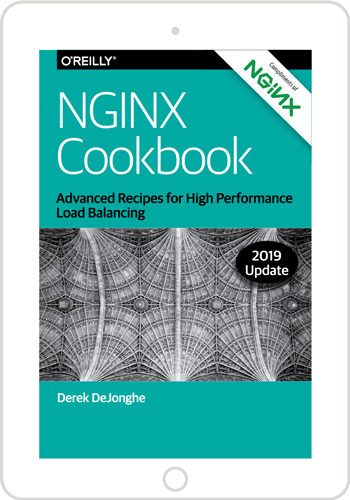 The High‑Performance Caching with NGINX and NGINX Plus ebook provides a thorough deep-dive on NGINX content caching.